On Christmas eve, a group of about 15 carollers braved the cold to sing around the South End. A highlight of the evening was our stop at the Balmoral, where we got a warm reception from the catering staff and some of the residents, who came out and sang along with us. Turkey Trouble: It was Christmas Eve in at the supermarket and a woman was anxiously picking over the last few remaining turkeys in the hope of finding a large one. This year (our second one), we got bolder and invited audience participation (we had a BIG audience.) The “12 Days of Christmas” turned out to be a lively song with wild & crazy headgear, and singers reinacted “I want a Hippopotamus from Christmas” with a bunch of placards. 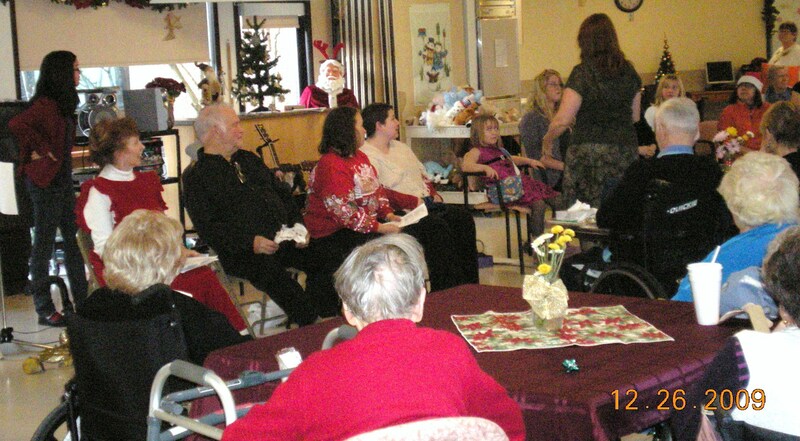 And we handed out stuffed toys, thanks to the Nanaimo Toy Drive, to both residents in the audience and also those who were bed-ridden and unable to attend. Soon these volunteers were all wearing silly hats. More on the Value Lodge’s nuisance property designation from the Nanaimo Daily News’ Dec. 1 edition. Click here. Merchants bail out as Port Place mall gets ready to renovate from Dec 5 Nanaimo Daily news article. The City of Nanaimo is undertaking the development of the South End Neighbourhood Plan. This Plan is intended to focus on the specific needs and desires of the neighbourhood while maintaining the objectives and policies of the City’s Official Community Plan (planNanaimo). You are invited to attend an Urban Design Charrette, a two day workshop to generate ideas and opportunities for the planning and design of the neighbourhood. As space is limited, pre-registration is required to confirm availability. Register early to guarantee a seat by calling (250) 755-4483. The purpose of this Charrette is to involve the community in a collaborative process to explore a preferred vision of the future South End neighbourhood development pattern, as one step towards the creation of a Community Plan by the Planning Department. The Charrette will include mapping of community assets, determining preferences for building form, open space, and urban design characteristics, exploring optimal locations for preferred forms of development and open spaces, and exploring ideas for making great neighborhood places. Charrette goals include providing an opportunity for participants to have a say in what their neighbourhood might look like as population increases and development continues, and for the Planning Department to have the benefit of this input. The output of the Charrette will include written and graphic material to illustrate the design process and to document the conclusions of each community design aspect explored. Participants will form teams that will work at separate tables and look at specific topics and issues. Teams will be a mix of professionals and non-professionals, and should have more or less equal numbers of members. Participants with particular interests and experience are generally welcome to join whichever team they prefer, and are not required to remain always with the same team. Drawing supplies are available to sketch and document graphic ideas on tracing paper. Mapping existing and preferred aspects of urban design and open space networks on tracing paper will allow maps to be overlaid and compared. Flip charts are available to record written ideas. Watch the newspapers and City website (www.nanaimo.ca/southend) for more information about upcoming events and opportunity for input into the South End Neighbourhood Plan Process. Festive greetings to all our members, new and old. As 2009 draws to a close here’s a review of what’s happened over the past year. As an association we are involved in a number of activities, all of which are designed to support our mission statement: “We are proud of our community and working to make it better.” Our greatest asset in the south end is ourselves! The neighbourhood level really is the best place to observe people power in action. It’s an old cliché, but together we really do make a difference. Cheers to all of us! The south end neighbourhood planning process is finally underway. SECA has long been advocating and preparing for a plan and we are delighted to have an opportunity to shape the future development of our beloved south end. SECA has contributed a number of members to the Neighbourhood Plan Steering Committee and many of you will have participated in the open houses that have contributed to the planning process thus far. A range of important issues are being addressed, including, land use planning; social issues; transportation and roads; water access; parks and recreation and so much more. The planning process will roll out over the next year and should be complete by next summer. Stay tuned for further opportunities to participate in this important process. 15 years and getting bigger and better every year. The picnic has become a signature event for the neighbourhood and our association. It is the single largest gathering for the neighbourhood and this year we had considerably more children and families than ever before. Thanks to everyone who volunteered their time, energy and enthusiasm, and to the many south end businesses whose generosity makes this annual event such a great success. The IPI campaign is a wonderful example of how SECA makes a difference in our neighbourhood.. For years, residents living next to the plant have complained about noise and disturbance from the plant., but had been frustrated by the apparent inability of city hall to address their concerns. Our relationship with city hall, our organisational capacity and our determination to hold the company and the city accountable to reasonable community standards, have been instrumental in forcing a number of changes by the company, including the removal of all glass processing from the site. Local people, coming together to support each other and tackle issues that matter in the south end. That’s what SECA is all about. The jewel in our neighbourhood is looking better than ever. A few years ago when the neighbourhood was particularly stressed, we identified and began advocating for the regeneration of the park as a key part of our neighborhood improvement strategy. We have enjoyed terrific support from the city in this regard. New equipment has been installed, the park is used by sports teams on a regular basis, “art in the park” is adding colour and vitality, and future plans, e.g., a multiplex sports court, are in the works. How else might we develop the park? How could the park be better used by residents as a place of gathering and fun? Summer concerts in the park? Our colourful art bins continue to pop up throughout the neighbourhood, devouring litter and bringing some much needed cheer and creativity to our streets. Snuneymaux First Nation liked them so much they painted some themselves and now have a number of bins doing their job on the No 1 reserve. We hope to plan another paint day soon, perhaps involving children from Bayview so stay tuned. Our monthly litter pick-ups have dwindled a bit and we might reintroduce our big spring clean one-day event next year. Thanks to staff and residents at the Balmoral for being involved with us, keeping us informed about how the project is developing, and staying open to a lively and at times challenging conversation in the neighbourhood about the project and the complex social challenges that we face in the south end. SECA has tried to support the project in a number of ways. Our monthly meetings provide a forum for information about the project to be shared and discussed. We have written to funding authorities to urge for adequate levels of funding so that the project can be a success, both for the residents who live there and for those who live near by. Particular thanks to Barbara Densmore and Larry Gambone for their wonderful efforts with the newsletter and blog. It has really changed the way we communicate with each other, both within the neighbourhood and beyond. The financial report will reveal more detailed accounts, but I just wanted to acknowledge the work of many of our members to raise money for our different events and activities. We recently held a very successful Beer and Burger fundraiser which helps pay for general SECA activities and our insurance costs, which are approximately $700 yearly. We raised over $6000 for our Miners Heritage Picnic this year and sales of the popular SECA T shirts, cards, silent auction and hot dog sales all contributed significantly to the SECA coffers. Thanks to everyone for their efforts and to the many local businesses who support our association. Just a few days ago SECA hosted an inspiring evening with Mark Lakeman from City Repair in Portland, at the new museum. Google “City Repair” for more information about the amazing work that has taken place in Portland. It’s a philosophy that we share. It’s about looking at how we can come together as neighbours. How we can create gathering places in our neighbourhood, rich with art and creativity, where we can get to know each other and have some fun. It’s about people getting out of their boxes and their cars and connecting! It’s what we do. How could we do more? We lost some much-loved south enders this year and we’ve been thinking about their legacy and how SECA can honour their memory. Many of you will have attended the planting of Gino Sedola’s memorial tree on the corner of Milton and Irwin, in what was a moving and fitting tribute to that great man. More recently Laura Ramsey passed away and again many of us attended her packed memorial service. We are wondering about a memorial flowerbed in the park for the vision impaired as a tribute to her. Chief Viola Wyse passed away and we honour her contribution to the lives of her people. Viola played a significant role in the recycling plant campaign and in speaking forcibly on behalf of her people’s interests. We have made a contribution to the Breakfast Club that operates on reserve in her memory. There are many little things that we do as an association that contribute to our mission. They include various media contacts where I or others share the south end perspective regarding a wide range of issues that directly or indirectly impact our neighbourhood. We try to talk about our strengths and all the great things about our neighbourhood as the best way to challenge many of the negative and myth based perceptions that exist about the south end. We helped the city plant trees in Maffeo Sutton Park; we went to the school board and participated in a dialogue about school facilities and advocated for the building we sit in tonight. We met with developers and gave them feedback on proposed new housing developments. We organized a neighbourhood soccer drop in at the park. We participate in the Neighbourhood Network Association with other groups from across the city. We invite local politicians and city officials to come to our meetings and get engaged with our association. We take every opportunity to appreciate and thank the many people and agencies that interact with our neighbourhood and work so hard on our behalf. We so very much appreciate their support. They include:: MLAs Doug Routley and Leonard Krog, Corporal Dave Laberge and his colleagues at the RCMP. Mayor Ruttan and members of council …thanks to all. As citizens participate in the South End Neighbourhood Plan a recurring theme is the way Nicol Street works – or doesn’t work. Click here for a brief look at some European ideas in place since the late 1970s. In Holland, there was a move to exchange the role of drivers and pedestrians. and to move away from the idea of using punishment as the carrot to drivers. The name “woonerf” or “living street” was coined. In the 1980s Germany, France and other European countries were influenced by these ideas. Traffic calming was influenced by existing patterns in the neighbourhood and design was directed by social behaviour not traffic behaviour. Research showed that 15% of drivers will always do what they please and the remaining 85% will respect and respond to the flow. 2004 saw the introduction of the idea of traffic calming as Slow Dancing ( think Ballroom Dancing). ” Dance floors don’t have lines and signals – everyone is slow and considerate.” Most of us don’t go crashing into each other nor do we injure each other. It was standing room only at Mark Lakeman‘s talk and visual presentation on Sunday Nov. 29. He told us that City Repair began when a handful of neighbors painted an intersection to slow the traffic. From there the concept grew to include cob benches, tea rooms (both fixed and mobile) tree and verge planting, public art of all description, community gardens and a beautiful village for the homeless. City Repair has now expanded to 20 cities across Canada and the USA. SECA is already on the right path, according to Mark, both with the projects we are working on and our mindset. Councilors Fred Pattje and Jim Kipp attended, as did Matt Hussman of the Downtown Nanaimo Partnership, and many city planners. Nice to see a lot of younger people there. Everyone seemed very inspired by the talk. A big thank you to the Nanaimo Museum and staff and a special thanks to Barbara Densmore who did a fantastic job arranging the meeting. Click here to see a slideshow of the evening. Mark Lakeman is a visionary architect, founding member of Portland’s City Repair & the 10-Day Village Building Convergence/VBC, and director of the ecological design firm Communitecture. Formed in 1996, City Repair was conceived as an “anti-virus” to combat isolation and over-commodification of conventionally designed cities, by literally inserting villages into cities. Now a national movement, City Repair combines architecture, urban planning, anthropology, community development, public art, permaculture and ecological design in projects that transform public space. See pics of Portland City Repair projects from one of our previous posts. Click here. The talk was organized by The South End Community Association (SECA) with the support of the Planning Institute of BC, North Vancouver Island Chapter.